Master bathrooms are one of the most important and most-used rooms in any home, so they must be impeccably-designed with functional elements that are aesthetically pleasing. 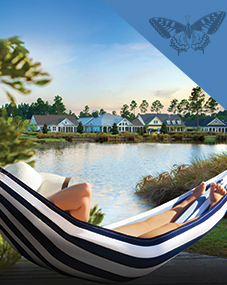 Legacy Homes by Bill Clark is an award-winning builder that provides residents of Brunswick Forest with gorgeous homes that feature beautifully-designed master bathrooms. Take a look at some of their helpful tips on the elements that make their homes’ master bathrooms so special! 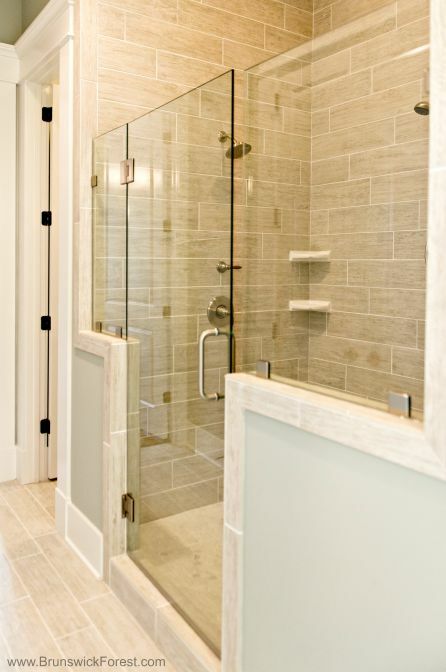 Frameless shower doors are one great element to incorporate in master bathrooms, and they are typically utilized in homes built by Legacy Homes by Bill Clark. 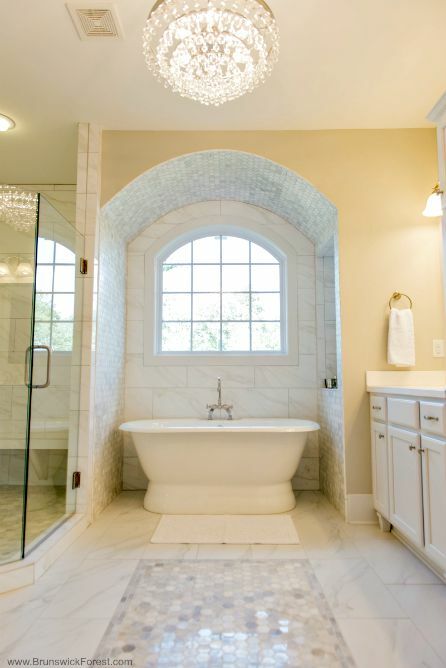 These elegant doors allow the shower’s interior tilework to shine and give the bathroom a clean, modern look. Freestanding soaking tubs are one design feature that is a must-have for many homeowners. “Legacy Homes by Bill Clark uses many types of tubs in their homes built in Brunswick Forest, but these freestanding tubs add a beautifully traditional and luxurious look and feel to any master bathroom,” says Legacy Homes by Bill Clark’s Director of Sales and Marketing, Annah Norris. 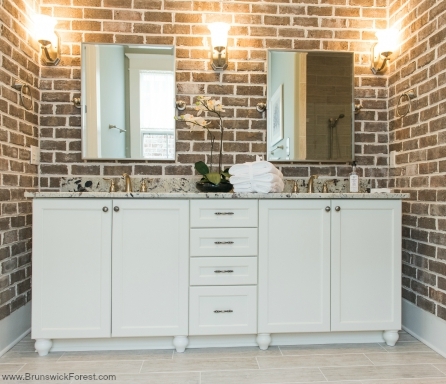 Vanity-height cabinets are often included in modern master bathroom designs and can be seen in some of the homes in Brunswick Forest. These cabinets are not only functional, but add a lot of visual appeal to the bathroom, especially when paired with a beautiful mirror and chic upholstered chair. Dual sinks are a must-have item for many homeowners, and they can be found in almost every single Legacy Homes by Bill Clark home at Brunswick Forest. Practical and functional, a dual sink vanity provides homeowners with plenty of elbow room in the master bathroom as well as additional countertop and storage space.